These stained glass medallions are among the many windows and doors that grace the historic Scripps Mansion, built in the late 1920s for newspaper publisher William E. Scripps and his family. They are inset in two of four leaded glass dining room doors that open onto a terrace and landscape designed by Bryant Fleming, a well-known landscape architect. The medallion at the left depicts a medieval English lord standing before his blazing dining hall fireplace, above which hang crossed swords and armor. In the background is a table below a window with similar medallions. The lord of the manor is facing the scene presented in the medallion on the right, which is inset in an adjoining door. It pictures a visitor who lifts his hat in greeting, after being admitted by the lady of the manor through the open door in the background. Flanking the two doors that show scenes of the host and his visitor are doors with medallions that feature a friar enjoying food and drink. William E. Scripps, son of Detroit News founder James E. Scripps, served as president of the newspaper from 1929 to 1952, the year of his death. An avid early aviator, he began distribution of his newspapers by plane to Michigan communities in 1919. He also founded the nation's first commercial radio station, WWJ in Detroit. Completed in 1927, Scripps Mansion (christened Moulton Manor by the Scripps family) was designed in the Tudor Revival style by noted Detroit architect Clarence E. Day, brother-in-law of Nina Downey Scripps, William's wife. 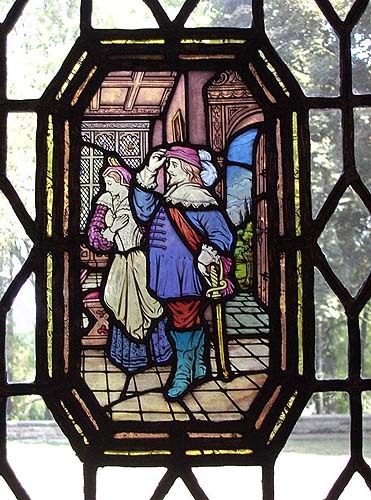 Its sixty-seven rooms are filled with elegant architectural details, including Pewabic tile, hand-crafted metal work by Oscar Bach, carved woodwork by the Hayden Company of New York, carved stone arches and mantels, and numerous stained glass windows and doors, many of which reflect William Scripps' interest in his family's English heritage and his love of Normandy. 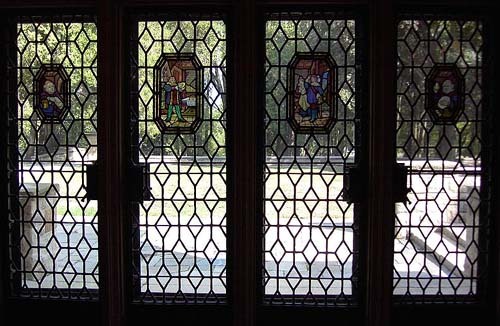 The Scripps family believes that one or more unidentified English studios created the medallions, which were installed by the maker of the leaded glass doors, the Crittall Window Company of Detroit. 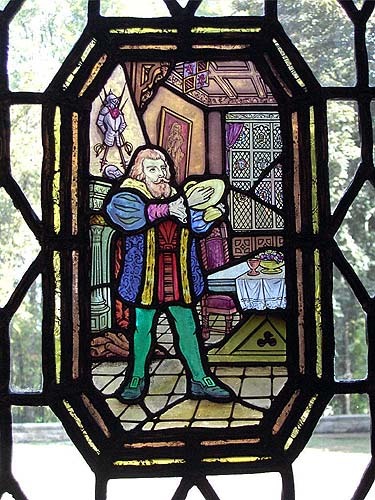 However, recent research has identified the Detroit Stained Glass Works as the maker of at least some of the windows (see Window of the Month for February 2007). Mr. Scripps chose the themes of the medallions to express the purposes of the rooms in which they are located. The dining room medallions recall the many distinguished visitors to the Scripps' country home. This theme of visitors to the home remains appropriate for annual public tours of the mansion and its grounds, led by members of the Orion Historical Society since 2003. Proceeds from these events have been earmarked for restoration efforts in the Mansion. 2003's event funded the restoration of the stained glass windows and doors, which was done by Shadetree Studios of Petoskey, MI. Since 1956, Scripps Mansion has been owned by Guest House, Inc., a private, non-profit facility for priests, deacons, brothers and sisters recovering from alcohol and chemical dependencies. More information about Guest House can be found at http://www.friendsofscrippsestate.org/index.html. Scripps Mansion was registered in the Michigan Stained Glass Census by Leslie Pielack, Orion Historical Society, Lake Orion. Text by Betty MacDowell, Michigan Stained Glass Census, July , 2004.